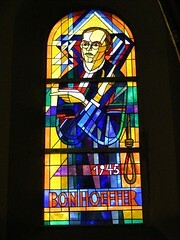 I am more than a little inspired by the life of Dietrich Bonhoeffer. Last year, I dove into the pages of his biography by Eric Metaxas and started referring to him as “my friend Dietrich” (see posts here and here and here). Okay, it did get a little out of control, but it’s hard not to be affected by this man’s life. Fast forward to yesterday, when this book appeared on my bed – right smack dab in the middle of Advent season (an early Christmas gift from my aunt and housemate). I flipped frantically through the pages last night – not wanting to miss anything, but wanting to get on track with the advent calendar days. I suppose my fascination with mystery has something to do with my reflection on Chesterton recently, or maybe Klosterman’s observation that the mystery of faith makes people nervous. Mystery lies hidden amidst the grid of everyday traffic and underneath the steady steps of time. Where we are constrained by our senses, mystery breaks rhythm and sets a new pace of possibilities. The I AM of the days of Moses became a babe in a lowly manger. The God who will one day ride on the clouds, shining like the sun at the trumpets call was ushered into the world with the sound of farm animals accompanying His humble arrival. The Messiah, our only hope of salvation, emerged from a womb and filled His little lungs with earth air. This is not science fiction – this is Truth, wrapped in mystery. How are you watching this mystery thread through your life this Advent season? This entry was posted in books and films and articles, Life Insight, Old and New Literature, theology and philosophy. Tagged advent, Christmas, Dietrich Bonhoeffer, Eric Metaxas, Messiah.